This item (U72721) is not currently available for purchase. Create a winter wonderland with white LED Moravian stars. A 60 inch lead wire lets you hang these brilliant stars almost anywhere indoors or outdoors. Long lasting warm white LED bulbs ensure that this beautiful star will shine brightly for many years to come. 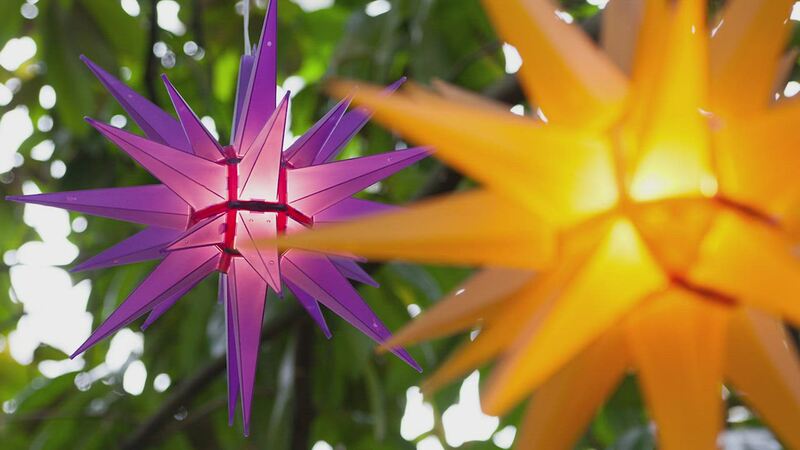 These glorious stars will glow brilliantly throughout your holidays. Easy to put together, pretty, and bright! Very happy with this product. I love this light. It is beautiful on my porch. My husband just loved it when he came in from work and saw it lit up. Love the product! Beautiful and easy to assemble. Material looks very durable. Looks great after its been assembled. Love that it came with a spare small and large piece. Perfectly sized for my 6 ft tree. It is meant to be hung up rather than mounted on top of a tree, but with a little creativity, you can use it as a tree topper. Definitely would recommend this product to a friend. Absolutely beautiful! Great addition to your holiday decorations. Well made, easy to assemble. You won't be disappointed! Love this star. It is exactly what I expected and the perfect finishing touch for my Nativity scene. Easy to put together and the brightness is just right. Wish the cord was opposite of the hanging hook so that the cord was less visible. Product came and was as advertised. Excellent product and easily assembled. I use this product for a tree topper on my Christmas display of trees, ranging in size from 6 ft to 24 ft. They have held up remarkably well. I have purchased these in the past and know that I will be getting more in the future. The LED is a big improvement. I was thrilled to see that Christmas Lights Etc has a 14" star. I received it and was amazed at how compactly it was packaged. This star is not assembled, but takes only a couple of minutes to assemble and be ready to hang. It appears to be of good quality. I would definitely recommend this product to my family and friends! Love the fact that this one has a LED light. Easy to assemble. Cord is long enough to allow for proper placement, or at least hide the junction where the star's cord connects to an extension cord. These are a nice size. High wind knocked off an entire spire. Upon falling, the spire came apart and could not put back together. Just had to replace the whole unit. Otherwise, it is a great looking piece. Reviewed by Rev Edward P.
Giving it 4 stars because I ordered two, but one of the bulbs did not work. The company sent a new bulb right away. Have a blessed Christmas! Very nice star. Easy to put together. Ordered two last year and was very pleased, that is why I ordered two more this year. Great looking stars! I ordered three of these for Christmas 2016. Easy to assemble, nice color and hangs with ease. I used this outside in the elements; the small holes in the spikes drained the water. I will be ordering more for the 2017 season. I recommend these lights. I simply love the way this star looks. This star was very easy to put together and looks beautiful. I will likely order some for friends. The quality of this product is not the best. Particularly, the point housing the bulb and cord fit very poorly into the frame. Would not place order for another. The Moravian star is very small. Also, it is made from very thin plastic. I hope this star look better far away than it does up close. Looks cheap. Gorgeous ! A beautiful addition to holiday light display . I am enjoying this beautiful star. Easy assembly too. Perfect size Moravian star for our front porch. Very easy to put together and Shipping was quick. Very pleased with this outdoor star ~ looks great night (and day)! Would be nice to have an upper hook for attaching but with my wire cords, all worked out. I was not impressed! I didn't like the quality and the fact that I had to assemble the star. Although this star us very nice & well constructed, I may be returning it since it is too small for my original need. Altgough this star us very nice & well constructed, I may be returning it since it is too small for my original need. Great star for the price!! The two sides would not stay together. I had to use duct tape to keep the star assembled. I was afraid to assemble this. I was fearful of breaking the pieces as it took force, I thought, so I had my daughter do it. I thought it counterintuitive that the cord comes out of the top where the hanger is,but I think I understand the reason now. It is a white rather than a yellow light but works well. I needed it as my nativity star for years did not survive my move. I hope this one lasts as long as it did. It is a nice star, good size, about right for its purpose. I would recommend it for the price as most other outdoor stars I looked at were very expensive. I also learned what a Moravian Star is! My mother-in-law bought a light similar to this one in 1999 and I have wanted one ever since! She now has dementia and can't remember where her is, so I can now carry on the tradition at my house. It is the perfect size to hang above my front door. It is just beautiful!!!! Love! Love! Love! I ordered 3 of the white Moravian Stars. They arrived quickly and I easily assembled all of them in about 10 minutes. They adorn the outside of my home and are very bright. They even came with extra pieces. I look forward to using these every year. Thanks for a great product! Loved the look, but the only size you stocked, 14" were not big enough to hang up in front porch. Wound up finding 21"ones in a local store that worked well. Haven't returned, as we have to pay to ship, as well as a restocking fee. The Moravian star is bright and beautiful in our window at night. Also, very easy to assemble. We purchased three of these to decorate our home last Christmas. When they arrived, we were skeptical of the quality given the feel of the plastic and assembly. We were, however, happy with the general look of them and loved the addition to our holiday decor. Needed to replace an old star that we had. This is a perfect replacement. Wonderful quality and so beautiful. Thanks! Reviewed by Plantasia Interiors A.
Spectacularly fun!!! A chimpanzee can assemble this thing. I purchased the white star, and I am bonkerz about them. Putting many many more up! I was very pleased with the timing and pricing of my Moravian stars. They are beautiful, and easy to assemble. Thank you. Bright and eye-catching, just what we wanted over our outdoor arch. Very satisfied with the star. Looking forward to putting it out for Christmas! I haven't used it yet as I'm waiting for next year, but it should be great. Simple to assemble and very nice. I purchased two, but one was missing its hanger. Quality control is lost. Beautiful star for tree topper or hanging. I have been searching for the star and it did not disappoint. I would gladly purchase again. I saw one of these, and had to have one. Very easy to assemble, and received earlier than promised. Everyone loves it. I would buy from them again. Very satisfied. Quick service, easy to assemble. A little turned off at first as the plastic looked "inexpensive", but I hung them immediately outside and was pleased overall. They had the look I desired. Beautiful star, easy to assemble. I have it hanging on a long hook off the edge of the deck. I wish the cable was black, I covered it with aluminum foil. I recommend it. I have the 14" white star, it is very pretty hanging in the center of my small arched front portico. I removed one star because it specifically states to. It hang it by the electrical cord, yet does not come with any wire for hanging. Great price, quick ship, easy set-up, and these Moravian Stars look great. They remind me of the pictures depicting the Star of Bethlehem and The Three Wise Men. Overall this decoration is very pretty. They're brighter than I thought. I was quite surprised when I opened the box only to find out I had to put each stem together by hand. At first it was somewhat difficult, but it got easier by the third one. I ordered 5 of these to compliment the eves of the front of my house. They come in several pieces that can be interchanged with other colors and even had some extra pieces in case they get broken. They look wonderful at night like a star explosion and we are very happy with them. The assembly was so fast and easy. The light is bright, and having the long cord and tab for hanging is perfect. Moravian Star - Great product! I was very pleased with the quality of this Moravian Star. We had one years ago and were looking for a new one. It is beautiful and easy to assemble. I recommend it. This Moravian Star was just what we were looking for. The perfect size and price. Assembly was straight forward - even pressure on the pieces made the star come together in no time. This star is great! Assembly is easy and it is beautiful! I can't wait to add it to my Christmas light display this year! Reviewed by stephanie and kevin B.
I was very impressed how ordering went and that we received the order promptly in the two days we requested. Also, I was impressed how easy it was to assemble the Moravian Star. The price was wonderful. Thanks! Will be ordering more in the future. Thanks again! Reviewed by Mary L R.
The hook be used to hang the star was missing. Good quality. Placing the order was easy and done quickly. Product was delivered on time. Great company to do business with. Awesome Moravian Star Christmas light. I love it! A really nice light and easy to assemble, looks good on my patio. May put it atop the Christmas tree. Didn't like the brown lines around the mid section, it takes away from the bright white light. Wish the cord was longer too but pleased with it overall. They are beautiful, but there is no way to wire them together as a chain- like you can do with other lights and their extension chords are quite short. Each star has a separate plug with no connector. I have them in our trees and they have to be close together and I had to buy extension chords to get it to work. Not as easy as Christmas lights and I couldn't get more than 5 in the tree due to all the chords. Excellent service. Quick delivery. Well made. Great job. This is a very well made Moravian star. Very easy to put together. We're very pleased with it! The star is easy to assemble and looks good when NOT lit. When lit, dark outlines of the central core shows, making the star unsuitable for use indoors or in an entryway. Perfect for a real and traditional Christmas! We haven't hung them yet, but they were easy to assemble and look very pretty. Service was incredibly fast - we received them within 3 days of ordering. I bought two of these for the tops of two firesticks I'm creating. They went together very easily and come with an incandescent lamp. I may replace the lamp and instead use an RGB LED assembly but the standard lamp might work just as well although just the one color of course. I'll know better after the 2014 season as to how they hold up. For now, they look very nice. The stars are exactly what I wanted and looks so beautiful hanging from my tree. I have had several compliments from friends and neighbors. I don't want to take them down they look so nice. We have been looking for a moravian star like this for quite some time, and this site seems to be one of the only places to find them. It was easy to assemble, had a sufficiently long cord (you may need an extension cord if your outlet is over 4 feet away), holds up well in the elements, and disassembles easily for storage. Great product. We love our stars. We bought three and hung them at 5 ft. intervals across our back porch. We bought an extension cord for use outside with three plugs. Some S hooks, a hammer and a few nails, some duck tape to protect the sockets and plugs, another extension cord to the electrical box on the porch, a ladder and we were in business in one and one half hours max, once the lights were assembled. The lights have stood up to rain, snow and drips from the deck above ours. They were easy to assemble once I got the hang of it. There is a house directly behind us and we enjoy their decorations on their front porch. We thought we'd create a little decorated quadrangle and it has worked out quite well. These stars are a wonderful outdoor tree decoration. I may buy more! Durable and withstood many a windy, winters night. They look beautiful and received many compliments. Ours are white, I was wondering if the bulbs could be changed to color for a different look next year? We wanted to light up a tall tree and these stars were just right. They were easy to assemble, bright and the wires were long enough to connect one to another. We plan on getting more next year. They looked great on our trees, neighbors all commented on the uniqueness of the decoarations. I bought two of the Moravian Star lights to hang on the patio for the holidays. They were simple to assemble, and sturdy when snapped together. The stars are light weight and easy to hang. They are beautiful when lit at night, the light is soft and not glaring. I already plan to order more for other times and holidays. I am so pleased with these lights, and I will use them for years. I loved these stars. They really glow at night, and they look elegant and classy. We also got 2 blue stars which are very nice. The blue is not as bright as the white, but they look more subtle and lovely. Altogether, I'm very happy with these stars. 14" White Moravian Star - Beautiful! I bought them for Christmas, but I'm going to keep them up all year long in my back yard. They are gorgeous and everyone that sees them comments on how much they like them. I'm going to buy them for Christmas presents next year! 14" White Moravian Star - Love the look! These stars look great when lit! We hung them in a tree outside the house and got many compliments on them. You need quite a few for impact, but it is worth the money. I would like to find various sizes in these stars for an even nicer look. They are an investment, but definitely worth it. Easy to put together by myself! They are very bright in the dark and very pretty. I got a lot of compliments from the neighborhood. I loved the first set so much that I ordered a second set, and next year I will order even another set! We hung the stars in our two large maple trees out front and the amount of glow from the stars was perfect in the night. During a couple ice storms, icicles formed and made them look even better! It is large 14" star, so keep in mind the size of the trees so it looks proportional. We love them! I purchased three of these stars and had to throw out two of them after only six weeks because they cracked. I like the star, but there are no instructions on how to put it together. We put them up today and they are lovely. This was exactly what I was looking for. Easy to assemble, and easy to take apart and store. Liked it so well, purchased 3 more! I purchased 3 white 14" stars and 2 purple ones. Martha Stewart Living magazine have the stars and lights on the cover. WOW the white stars are beautiful. I have received numerous positive comments. The purple stars are on another tree with purple lights and the stars do not show up as bright though they are still pretty. Love them. I couldn't believe how fast the light strings got here, I am very pleased with everything. The stars (2) are just what we need for the tops of our two Holly Trees that we decorate with miniature lights.